I’ve been on a mission to get healthy lately. I don’t want to just slim down a little this time, I am really making some life changes. The meal I have really struggled with for the longest time is breakfast. Most breakfast items are full of carbs, and I don’t want to eat eggs every. single. day. So, I decided that it was high time to jump on the smoothie bandwagon. I love smoothies, but they are usually full of sugar, so I wanted to find one that is healthy and also green…because we could all use a little more green in our lives, right? 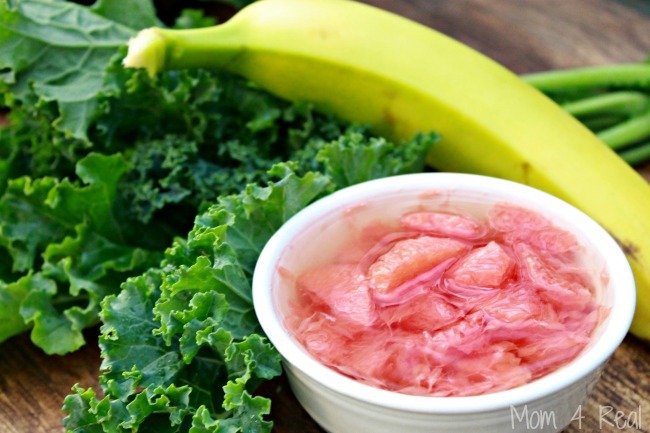 This Grapefruit and Kale Green Smoothie has become my new favorite go to breakfast! I feel more energetic in the mornings now, and I feel like since I start my day off in a healthy way, that I feel good about keeping it up througout my day! Win, win! 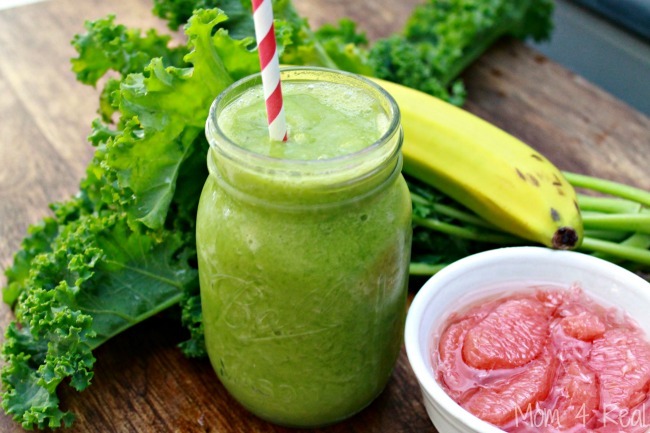 Healthy energizing grapefruit and kale green smoothie. Place in blender and pulse until smooth. 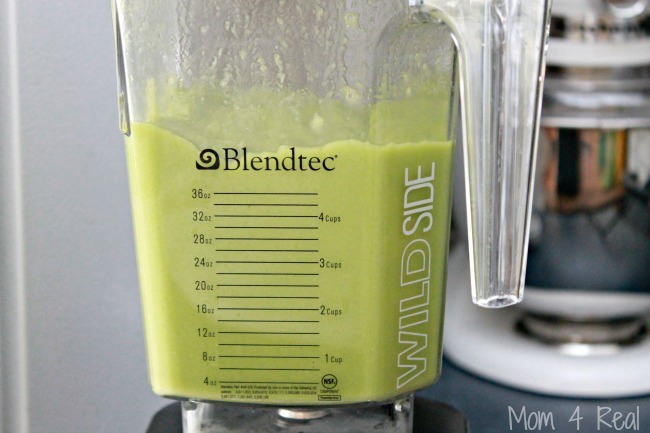 In a Blendtec, simply hit the smoothie button. Poor in a glass and enjoy! For my smoothie, I used DOLE Red Grapefruit Sunrise Fruit Bowls instead of fresh grapefruit so I don’t have to cut and peel any fruit. They are so convenient, and are not packed in syrup…they are packed in 100% fruit juices, with no artificial sweeteners, and each bowl is 1 full serving of fruit! 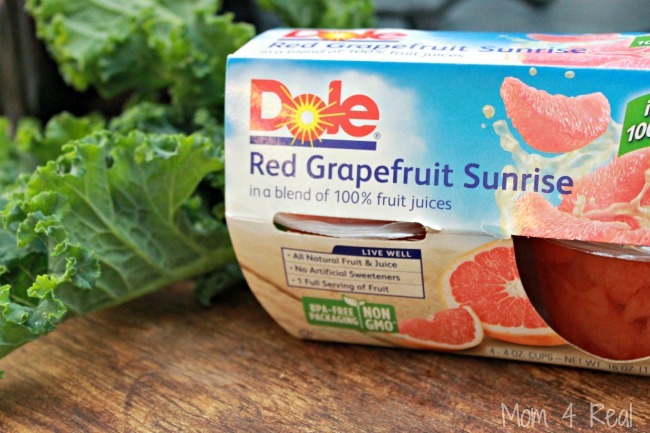 New DOLE Red Grapefruit Sunrise Fruit Bowls are naturally gluten free, contain no GMOs (genetically modified or engineered ingredients) or artificial sweeteners and feature BPA free packaging, and can be found in the canned food aisle of your grocery store for around $3.99. I love the addition of the kale as well…getting an extra serving of veggies into a meal that never used to include vegetables for me is a definite plus, and kale is packed with vitamins and nutrients. 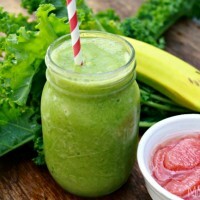 The banana helps to bind the smoothie together, and is loaded with potassium. I like to add the orange juice for just a bit of natural sweetness, but you can totally substitute it with almond milk or even yogurt if you like! 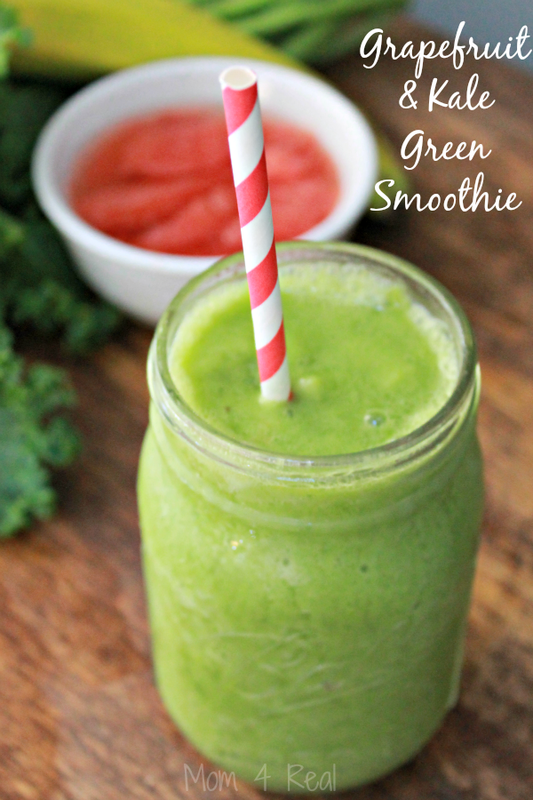 This green smoothie not only tastes amazing, but is quite filling too! I can’t wait to play around with it and add some different fruits to change it up a bit! This post is sponsored by DOLE. 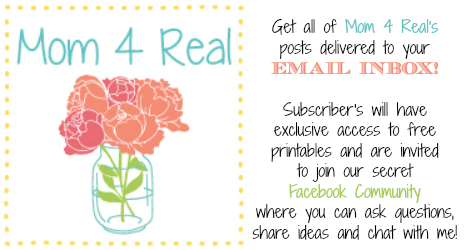 All recipes, photos and opinions are 100% mine! Doesn’t it look delish? Not into smoothies? No big…these little grapefruit cups can be enjoyed on the go, right from the plastic bowl with an easy peal lid! You can even take them in your lunch! Did you know that February is National Grapefruit Month? Now you can celebrate by enjoying your favorite fruit all year around from Dole, the number one brand in single serve fruit cups. Be sure to check out the DOLE Website, and follow them on Facebook and Twitter too for tons of fruity information and recipes!